Well, Mr. Yohn was once caught wearing a baggy green shirt and brown cargo pants just like Shaggy from Scooby Doo. He also wears other clothing items that people could compare to Shaggy. We, however, have yet to confirm that he has a dog (which would probably be named Scooby). Recently, Mr. Yohn’s hair has seemed to gain a lot of sudden popularity. It now even has its own Instagram account that is run by an anonymous ninth grader at Marina High School who used to have Mr. Yohn for Social Studies. Our theory is that everything he does is controlled by his hair, completely. His hair makes every decision, from waking up, to teaching his students. Our evidence for this is we know that Mr. Yohn is not human (as proved in our previous Mr. Yohn episode). So his brain could be attached to his hair as well. This attachment may be why Mr. Yohn is so incredibly smart. I mean I think we knew this was true all along. You can’t be as smart as Mr. Yohn when you have a normal brain. His hair has super intelligence powers. This leads us to one of our next theories. This theory is written by a special guest writer who wishes to remain anonymous. We all know Mr. Yohn teaches a little bit different than other teachers do. Perhaps he’s planting his own ideas into his students’ minds so that they can go spread the word. Spread the word about what? Well, to spread the word that he is secretly Ivanka Trump. But why would he want to spread the word? Why is he making his students’ messengers? Maybe, it has something to do with the election coming up next year. Maybe, it’s because he knows the country is more divided over Trump than ever. This is where the theory comes in. We think Mr. Yohn is actually Ivanka Trump, and he/she is trying to create more supporters for her/his father. He/she loves his/her father and wants very dearly for him to win, and who better to start with than the young people. Maybe Mr. Yohn’s face is just a mask, we all know that his hairline couldn’t possibly be that perfect. Now that we know that Mr. Yohn is super intelligent, we know that there can be only one explanation for his massive brain; he is a superhero. We knew this all along. He could have super intelligence. 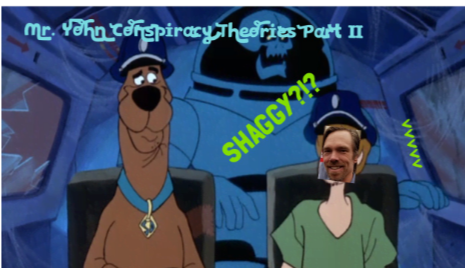 Or, maybe this has a tie with our first theory and his superhero name is Super Shaggy. Could you imagine? Super Shaggy flying down your street, until you realize your Social Studies teacher is flying? We could. Mr. Yohn is obviously obsessed with Social Studies. I mean, he teaches it, researches it, and even makes his students watch movies about history (probably so he could watch the movies a million times). Sometimes he even pretends that his ruler is a musket. This leads us to believe that Mr. Yohn is actually living in the 1800s. Somewhere in that mysterious classroom of his is probably a time-traveling button so he can get back and forth from the 1800s and present time. Maybe this is how he became immortal. Well, that’s all we have for today, Cougars! Do you think that these are true? Does Mr. Yohn have a pet named Scooby? Make sure you vote in the poll so we know which teacher we could expose next! See you next week, Cougars! Don’t forget the times when Lewis + Clark literally went into Mr. Yohn’s body. What normal person could do that? I remember when Sacagawea went inside of Mr. Yohn. It was amazing. More, we need more theories. Theory: Why did Adrian *really* leave Journalism? Well, the old Gavin didn’t want to take Japanese at MHS, didn’t he? Yeah, it’s best to keep Gavin as he is. Ms. Thatch is actually Chevy but she adopted a dog and named it Chevy. That is what she used to cover herself up. Bro this is so funny, nice idea. Ms. Thach has a closet of mugs. What are they for? Well, her dead student/victim’s blood, of course. She not only drinks it but is putting it into the snacks she feeds her students on a weekly basis, slowly turning them into her personal demons.